I am a full-time homemaker and look after two well-behaved dogs, (male white schnauzer, 8 years old, and female golden labrador, 4 years old) at home. I have been a dog lover for over 20 years. I fully understand what the dog owner needs for the dog while they are on holiday. Our home boarding license has been inspected and approved by Central Bedfordshire Council. I have a 5 bedroom semi-detached house with a secure big garden (See Photos) giving enough space for the dogs to play. We also have a doggy lounge inside the house for the dogs to play. I prefer to take my dogs to different places every day for a walk. Normally will take my dogs to Rushmere park Monday and Friday. Wednesday & Sunday will go to Ivinghoe. Tuesday, Thursday & Saturday will go to the end of my road is country fields. I also spend an hour a day to play with my dogs at home. We only accept dogs whose vaccinations and anti-fleas medications are up to date. We are happy to administer any medicines your dog might need. All dogs must disclose any medical issue before the service starts. We only accept soft breed friendly dogs and well-behaved dogs. We do not accept larger dogs. Collect & Return Service on request. We will always make sure your dog in our care is fully supervised. Fresh chicken & beef mince can be added onto your dog dry food. (no extra cost). We left our two yorkshire terriors with Thomas for a week, and he is certainly 5 stars constantly keep us updated with photos and videos. If the dogs could talk I'm sure they would love to see him again. Tommys Doggy Heaven has been fantastic for our Labrador puppy Maya and us. A high level of care, professionalism, flexibility, attention to detail and a bespoke approach to suit our specific needs. Thomas has and continues to provide all the assurances we need that Mya is in very good hands. Regular daily updates which includes pictures and videos. We will definitely continue using Thomas and would highly recommend him. My puppy has been coming to Tommy Doggy Heaven since he was three months old for a mixture of day care and boarding. The care he has received has always been exceptional . Tommy cares for the dogs like they are his own and keeps you fully updated on a daily basis. I would not hesitate to recommend this service. Thanks to Thomas and Simon,left our 12yr old cocker spaniel for a few days. My husband and I found the service fantastic from start to finish. They Kept us informed with pictures and videos daily. We would recommend their service and found the whole experience great. We would definitely use them again. We had a wonderful service from Tommy Dog Heaven. We nervously left our 14 week old Goldador Puppy for a week, but these fears quickly disappeared. Tommy provided regular Watsap photos, videos and updates, which allowed us to completely relax and enjoy our holiday. It was clear to see that our Puppy was having a great time and was taken on nice walks and enjoyed playing with the other dogs. Tommy is very knowledgeable and provides lots of useful advice. I would recommend Tommy Dog Heaven to anybody who is looking for a home boarder, we would also definitely use his service again. Thank you. we just came back from vacation and see our Cookie was the best moment for us. Thomas and his adorable dogs took care of our Cookie. He kept us up to date every day with photos and videos during their walks in beautiful places. I believe that Cookie will miss their company so much. Impossible to give him a higher rating but for us it is a ten stars. Thanks Thomas for everything! Wonderful service with Tommy Dog Heaven. Our dogs were looked after exceptionally (shown by many photographs and videos sent to our mobile phone whilst away). Our dogs were given lovely long walks and looked truly happy with Tommy. We were shown daily photographs and videos which showed that our dogs were safe and happy in Tommyâ€™s care. We are very grateful to Tommy for doing this â€“ this is great service. This is the first time that we have left our dogs with a dog carer to go away. After meeting Tommy and walking our dogs with him we realized how much he cares about dogs and how much knowledge and connection that he has with them â€“ our dogs loved him. Lovely kind Home to leave your precious dog with. Can fully recommend Tommy Doggy Heaven. Whilst our dog was there, we received lots of lovely photos and videos of him which was so lovely to recieve. Huge thanks ! Can't fault the care our dog Pepper enjoyed with Tommy. She got on well with the family dogs who welcomed her into their pack. 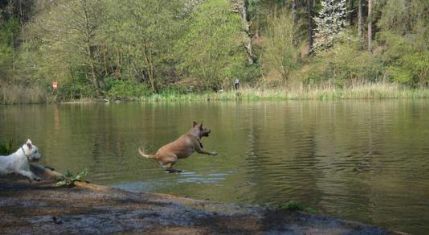 She had all the comforts of home, long, varied walks and a little of Tommy's training to get her out of some bad habits! We were also given updates and photos through messaging every day we were away so we could see she was enjoying her stay. I have no hesitation in recommending Tommy to other dog owners. What a wonderful experience for our puppy Frenchie to stay with Tommy for 10 days. And what a relaxing time for us to know that he was under his care while we were away. We received regular updates with pictures and videos of their walks, their play time at home and his interactions with the resident dogs, Snowy and Bobo. Tommy and his state of the art facility are the perfect solution while we are on a trip and we cannot take our frenchie with us. I strongly recommend Tommy Doggy Heaven as your dog carer. Thomas is best hone boarding service I have encountered. The service he provides is first classs. He really care about the dogs and treat as part of his family. My dog come back with smile on the face. I would highly recommended his service to anyone. We operate in the area within 20miles from our home. Please contact us between 8am-6pm to make an appointment to discuss your request. Please come to visit our home to make sure you are happy with our service before you make your booking.